It was “Anchor Day” here at the Landscaping By J. Michael office when our crews had their first crew meeting of the new season, where they discussed fall services, changing expectations, and upcoming projects, including the transplant of a large Dogwood Tree for one of our clients! Of course, transplanting a tree is enjoyable and fascinating work for a landscaper, and even tends to get people in the office talking. After all, who would imagine that you could dig up a beautiful tree, relocate it, and watch it thrive in its new home? Nevertheless, there are some critical points to be investigated before transplanting a Dogwood Tree, and a successful transplant requires proper planning. In this case, the plant to be relocated had very sentimental value to our clients, who planted the Dogwood Tree when their children were small. Now, the tree (pictured above) has grown tall, and needs to be moved to a different spot on the property, where it will continue to get stronger! The transplant was a success, and we thought it would be fun to share some important factors we took into consideration before diving into this assignment! Landscapers must learn all about a phenomenon called “transplant shock,” how to avoid it, and how to cure it once it strikes! Transplant shock refers to the various stressors that occur in recently transplanted trees and shrubs, including failure of the plant to root well in its new landscape. This sort of thing happens because plants were not designed to be moved from place to place, but sometimes it’s worth moving our beloved plants to a better spot. Fortunately, there are ways to avoid transplant shock, and methods to care for plants that do experience this setback. First of all, our crew will be sure to disturb the root as little as possible, which means they will bring along as much of the root as they can, and then will avoid roughing up the root ball or shaking dirt off of it. In fact, you will notice in the photo, that we have used a cover to protect the root during the move. Another trick is to keep that root moist throughout the entire process. Even after replanting, you should continue to provide the plant with plenty of water. This will help the plant settle healthfully into its new location. 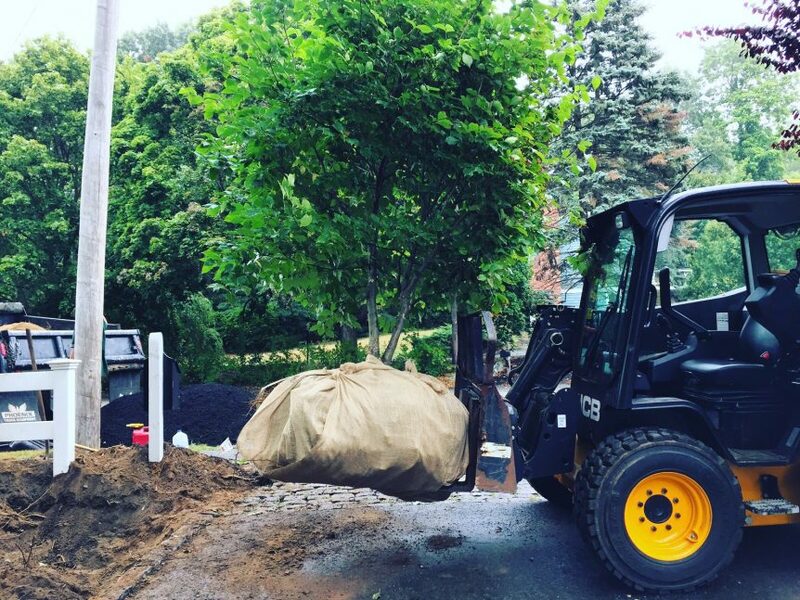 There’s never a guarantee when it comes to tree transplants, but professional landscapers are trained on how to transplant trees and shrubs successfully. And while our crews have learned the fundaments of relocating plants, there are also some pretty interesting ways to minimize the effects of transplant shock. For example, if your transplanted tree or shrub is struggling to flourish, you can always add some sugar to its diet! This strategy may sound bizarre, but studies have shown that a solution made from water and plain sugar can help the recovery time for plants suffering from transplant shock. J. Michael also let us in on another trick, which involves adding seaweed extract. He explained that the risk of a transplant is that you’re cutting off its means of consuming the nutrients it needs to survive. With a tree transplant, you’re taking a mature tree (its trunk and its canopy of leaves) but then you’re removing a chunk of its roots! A good landscaper will have the know-how to help the plant rebuild its roots as quickly as possible! For our most recent tree transplant, the client was requesting to have the work done immediately, but J. Michael tends to suggest holding off until November for transplants. It’s best to relocate a plant while it’s dormant, in order to minimize the chance of a decline. This usually means scheduling a transplant between the months of November through March. If you have any questions, you should feel free to call us here at Landscaping By J. Michael, to speak with an expert! We hope you found this brief tutorial on tree and shrub transplantation interesting! Be sure to call J. Michael for your tree planting or replanting needs.